Steamy was one of my very first MAC purchases. I wore this at my mom's wedding (Spring 2003) and it looked fabulous on. Steamy is a very pretty turquoise blue. This and Tilt are masterpieces. To make a blue or aqua subtly complex and yet not dull is masterful! I do think MAC formulas for the sheeny/shimmery colours has worsened. Reason being I bought Tilt and other shimmer/sheen colours years ago and they dont crumble despite being abused. This and Jest both crumbled on me. :( bought them both last year- they can be repressed but just necessary to note. Steamy is gorgeous though. I wanted it since I was in high school and purchased it 10 years later! This to me is a true seafoam green. There is a turquoise yellow sheen to it. A very frosted color that is strongly pigmented. Great accent colour..This and Nylon- just gorgeous together- add Moon Reflection and you've mimic a peacocks colouring. So many combinations to try, fun colour to play with . A defin repurchase for me. I like wearing Steamy as an accent colour either along my upper lash line or my lower lash line for a fun look. I wore blue eyeshadow all over my lids when I was a teenager and it's not a look I wish to recreate in my late 40s. I will pair Steamy with something like Urban Decay's Free love or Fireball as I think corals and blues work well together, if done appropriately. As it's a frost texture, the staying power isn't that great when the eyeshadow is worn by itself. If I wear it with another eyeshadow, it lasts longer. Definitely a cool, retro colour and I'll be using it my makeup looks once summer hits. I'm absolutely obsessed with this eyeshadow. It is such a beautiful metallic turquoise-aqua shade. The pigmentation is fantastic and it really suits my brown eyes. 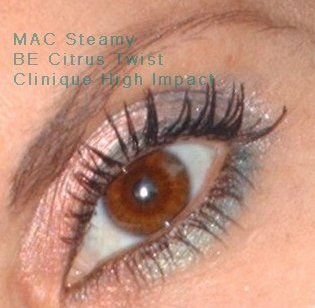 I love it with MAC Saddle in the crease lightly with a white-gold in the inner part of my eye, Steamy in the centre and a black eyeshadow with a sheen to smoke it out a little. Overall, amazing! I adore this beautiful and unique turquoise frosted mixture of green/blue/gold! I have ordered colors similar from other brands but they don't hold a candle to Steamy. This is a very striking in your face color - very bombshell. I think it really brings out the eyes and works great for all eye colors. What a beautiful, pigmented shadow! I normally wouldn't reach for this, but a friend passed it off to me and I've discovered that this color looks amazing with my blue eyes. I sometimes just smudge it into some turquoise liner on the lower lash line (I like Rimmel Scandaleyes kajal liner in Turquoise). Then sometimes I venture out and put it on my lid. When it's on my lid -- I like to tone it down a bit with a light shade on top. It gives me an icy look and really brightens up my eye area. I don't think I'll need to buy this because it will last me forever, but I will enjoy it while I have it. The most gorgeous shade of turquoise eye shadow that you will fine. The quality,opaqueness, ease of blending is not matched by any other company.I really didn't think I needed this since I already had Swimming(a light green) however I recently purchased Stars & Rockets along with Vibrant grape & saw this look featured with Steamy on a blog. No doubt when doing one eye with each Steamy most definitely set the look off. I also tried Aquadisiac since they are similar but Steamy formula is much better. Recently bought and still experimenting on. Looks vibrant whet pat on the lid with a 239 brush, but faded to a very pale bluish green when I tried to blend it a bit with a 217. Not my best eye shadow to work with. My favourite combination so far is heavily applied (pat, not swept) on the inner 1/3 of the lid, cork on the outer part and lots of black mascara. Better apply over a paint pot, as it's not really long-lasting on its own. I love this turquoise eyeshadow! Blends great and lasts all day. Like to put a little of deep truth in the outer corner of the eye with it.